Crystal isn't my best friend or coworker. She's never met me but yet she knows me. Ask Crystal about me, and she'll tell you that I'm ambitious (true), easily distracted (mostly correct), and makes quick decisions that can seem unpredictable (eh, sometimes). And then she'll tell you how to interact with me: bring lots of energy to the conversation (yes, please), and use an emoticon (so true! monkey emojis preferred). Crystal is a tech startup that scrapes the web for a person's online information to analyze his or her personality. Its purpose is to help people interact more effectively with one another. Founder Drew D'Agostino came up with the idea for Crystal to suit his own needs. He was heading up an engineering team at a software company and wanted a better way to foster work relationships. Crystal wasn't meant to be a stand-alone business -- D'Agostino was simply trying to understand his coworkers. "I figured out a way to detect people's personalities based on anything they've had written about themselves online," he said, of the original prototype. Using available information, Crystal assigns a person to one of 64 different personality types. It provides one sentence about communication style, then breaks down how to speak to that person, how to email them, work with them, recruit them and more. Crystal predicted my personality -- and it was pretty dead-on. Crystal's personality search functionality is free -- but getting people to convert into paying customers is the harder sell. Crystal also offers premium features for a monthly subscription (ranging from $19 to $49). 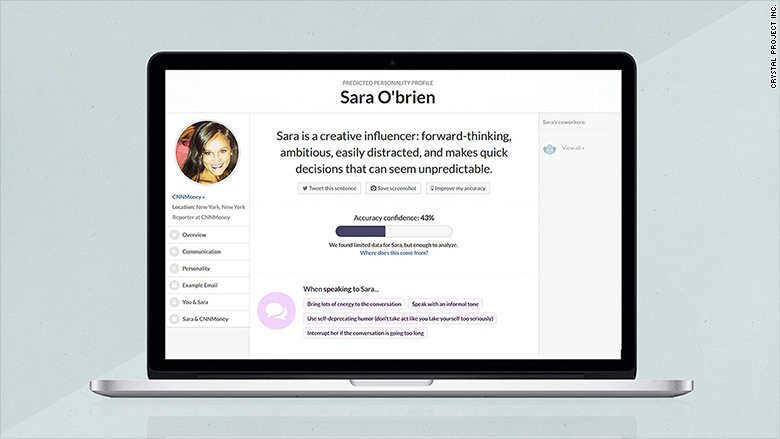 These tools take the personality data one step further. A Gmail plug-in helps you tailor emails to best suit the recipient's personality. 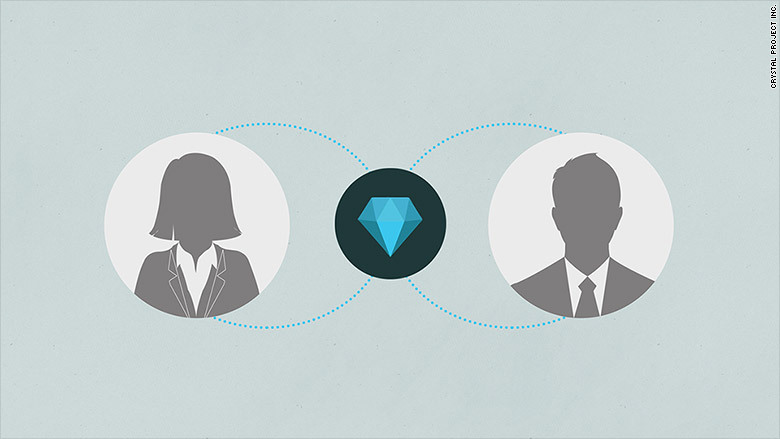 A relationship prediction tool shows how a person might fit into an existing team. Entrepreneur Lane Campbell said he tried out the Gmail functionality as part of a free trial, but didn't think it was worth paying for. "I didn't find it valuable to pay for, [but] the predictions were accurate," he said. "The usability is what they have to figure out." Campbell said he would love a version of Crystal that automatically wrote emails for him. Currently, users are prompted to consider different greetings or turns of phrase, but it doesn't craft entire emails. Another entrepreneur, Yan Revzin, said he paid for a subscription for his interns, some of whom don't speak native English. "It was a great help for the interns," he said. "They don't teach how to write emails in college." Revzin said that it was just a temporary expense though: "After a month or two of using it extensively, they didn't really need it. It becomes repetitive." Crystal is still in its early stages. D'Agostino, who is based in Nashville, runs the company with four full-time employees. He said the business has taken off by word of mouth since launching about six months ago. He's seeing about 1,000 new users sign up each day -- most of whom aren't paying. But he said employees at firms like Accenture, Hubspot, Google (GOOG) and Thompson Reuters are all using the service, as both free and paying customers. As for Campbell's suggestion, D'Agostino hinted at developing a "reply all" type functionality. "We want to add value for everyone," he said.